On stage, under bright lights and in front of a near silent crowd, Team Sanivation awaits the announcement. They hear their name and the crowd erupts. All of their hard work and dedication has led up to this moment, and despite their confidence in their life-saving invention, they are shocked. 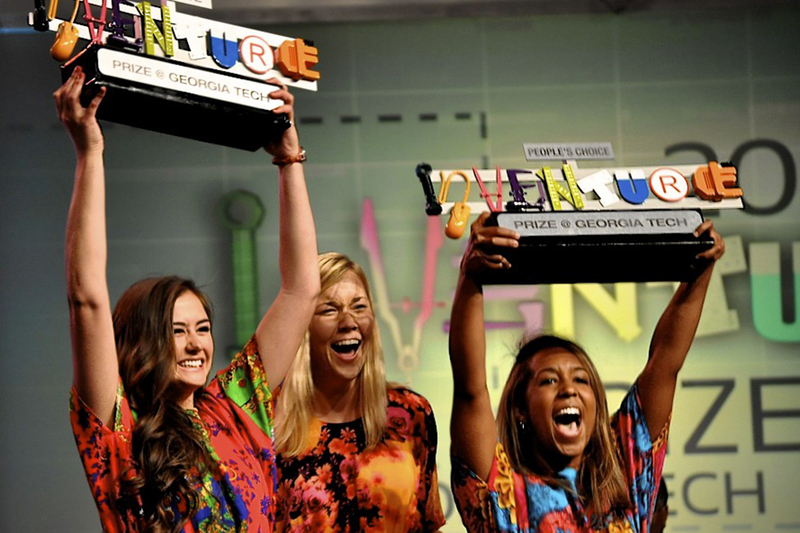 Team Sanivation, made up of Brandie Banner, third-year CE, Jasmine Burton, fourth-year ID and Erin Cobb, fourth-year ID, recently won first place in Tech’s famous Inventure Prize. The team stole the competition with their invention, the Safi Choo Toilet, which is an inexpensive, mobile toilet which will potentially bring relief to many refugees in developing countries. The idea for the Safi Choo Toilet came from the team’s senior design capstone class. A large part of the inspiration also came from all the members’ belief in the importance of public health and humanitarianism. “Though our areas of studies and life experiences differ dramatically, all four members of Team Sanivation share a passion for humanitarian design. We drew inspiration from existing precedents, innovative technology just entering the market, and cultural influences specific to Kenya to define our design direction,” said Cobb. In fact, because the idea came from their capstone course and the team did so well in their capstone expo, they were automatically awarded a place in the Inventure Prize semifinals. Despite this early success, Team Sanivation was still shocked and ecstatic they had won first place. “For me, it was the shock of them calling our name for first place. After we won People’s Choice Award, it had not even crossed my mind we could also win overall,” said Banner. “In the pictures posted over social media later, the disbelief on our faces shines through the teary eyes and huge smiles. As a team, we are so grateful and continually humbled by the experience,” said Cobb. The best part of the competition was not at all winning it, though, according to the team. “The most rewarding part of this process has been the ability to impact lives. Thanks to Inventure Prize, our Safi Choo toilet has the potential (and now the financial backing) to change sanitation on a global scale,” said Cobb. At the 2011 Women’s Leadership Conference, Burton’s eyes were opened to the ‘sanitation crisis’ that affects over 2.6 billion people worldwide. Even more, women are disproportionately hurt by the lack of toilets because girls are often forced to drop out of school when they reach puberty. Furthermore, women in these areas have to wait to defecate at night for fear of sexual assault. Team Sanivation puts much on their success on their team dynamic, which was built off of mutual respect and friendship. “The dynamic culture of studio allowed us to collaborate without constraint. As a team, we fed off of each others ideas, got into healthy debates, and explored the limits of our design. Looking back, I cannot imagine a more diverse combination of strengths,” said Cobb.